If you're anything like most people, it’s easy to overdo it a little during the holidays. Shopping, eating and family get-togethers shoot to the top of your list of priorities, while managing your weight suddenly plummets to the bottom. For all of us who are facing as many as three or even four holiday parties, we must first admit how hard it is to stay on track at this time of year. You’ll be anything but merry if you allow yourself to indulge mindlessly on every snack in sight because these calories add up quickly. Be prepared to literally drag yourself away from the egg nog, chocolate chip cookies and fruitcake to sidestep temptation. It may help to remember that every pound you gain now is a pound that you’ll have to take off when you’re making your New Year’s resolution in January. So if you’d like to get through the holidays without gaining any weight, here are a few strategies to help you enjoy this season without the need for a new wardrobe afterwards and the harsh reality of dealing with weight regain. Start your day with some physical activity. Exercise is one of the best ways to decrease stress, tension, elevate your mood and burn extra calories. Take a brisk morning walk, lift weights, dance, climb stairs. Repeat physical movement throughout the day. Extra demands on your time may tempt you to skip exercise. You could easily fall out of the habit of performing physical activity and find it harder to start back up. Remember, small bouts of activity add up. So, does bumping up short bursts of intensity. 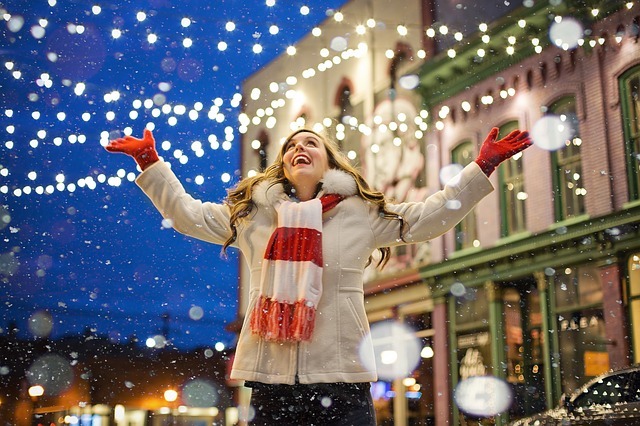 Instead of meeting a friend to eat, meet to walk the neighborhood or town to look at the beautiful holiday lights. Be food & drink savvy. Survey food selections at parties. Enjoy vegetables and fruits with or without low-fat dressing. Try a favorite protein source such as fish, meat, poultry, tofu, egg or beans. Take just a single taste, one tablespoon or a half cup of starchy foods as potato dish, rice, bread or noodles. Chew each bite thoroughly and really enjoy the flavor. Focus on foods that give you the best bang for your calorie buck. Move away from the table to enjoy conversation and atmosphere. Do not arrive to festivities feeling hungry. Eat a protein source prior to attending. Stay refreshed and well hydrated. Sip lightly. If you decide to have one alcoholic beverage, enjoy sparkling or flavored water, club soda, or water with lemon or lime wedge. And remember… spreading the holiday spirit is calorie-free! Don’t forget food safety. Many people get sick during the holidays, unaware it may be due to poor food safety. So be sure to wash your hands and utensils often with warm water and soap. Don’t cross contaminate raw and cooked food on the same preparation surfaces or touch someone’s hand after a germy sneeze. Avoid dishes containing raw eggs or licking the spoon of raw cookie dough. Uncooked eggs may contain Salmonella bacteria that cause food borne illness. Before roasting, make sure your turkey or poultry is fully thawed to ensure inside heat is high enough (165 degrees F) to kill bacteria. This is especially important when stuffing the bird cavity. Keep in mind that food left out on the table or counter more than two hours becomes a breeding ground for bacteria. Refrigerate leftovers early.